You are here: Home / Mergers & Acquisitions / Steel Horse Automotive, Inc.
Steel Horse Holdings, Inc. (“Holdings”) was a holding company for subsidiaries engaged in the design, manufacturing and distribution of automotive parts and accessories.Holdings was in financial distress due to challenges arising from its entry into the mobile electronics market and its transition from a distribution to manufacturing company. 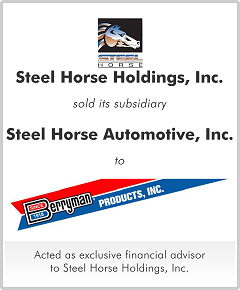 Steel Horse Automotive was the second largest manufacturer and marketer of light truck accessories for both the OEM and automotive aftermarket. Professionals of M&A Capital were hired to conduct a marketing process that sought to identify, educate and negotiate the most qualified financial and strategic buyers. To maximize value, an auction process was managed between buyers interested in Holdings in its entirety and those who were interested in the individual subsidiaries. 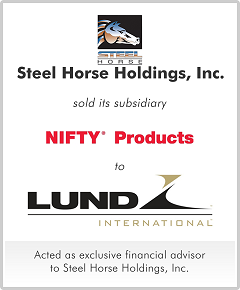 It was determined that a sale of Steel Horse, separate from Nifty Products, would maximize Holding's value.